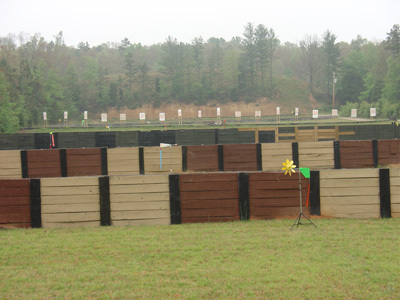 Charlotte Rifle & Pistol Club’s Outdoor Ranges have one of the most comprehensive rifle facilities in the area. Our Rifle Range extends to 300 yards and can accommodate more than 35 shooters, with range options from 50, 100, 200 and 300 yards. In addition to target stands, the Range has iron plates at the 300-yard mark. The Range provides benches as well as space for prone, kneeling and standing positions. The Rifle Range is open to all CRPC members and guests. We strongly encourage host members review safety rules with guests before they arrive for shooting. All Rules are conveniently posted at the Range for further review. Members who are not rifle qualified and all guests must be supervised while they shoot. This requires personal monitoring by a member who is rifle qualified. To ensure complete safety, the rifle-qualified member is prohibited from shooting while supervising a non-qualified shooter. The supervision is one-to-one. If more than one guest/non-qualified member is present, only one may fire per rifle-qualified supervisor. All non-qualified members and guests are prohibited from firing while the qualified member shoots. New members are encouraged to become rifle qualified to fully enjoy the Rifle Range experience. Prior to qualification, the member should be supervised at least once in shooting by a mentor, qualified member, NRA-certified Rifle Instructor or Range Safety Officer. The member seeking qualification must demonstrate a thorough understanding of the Range Rules, proper handling of the rifle from setup to take down, proper Range etiquette, and basic marksmanship skills. The supervising member can determine if the new member is prepared for the Rifle Familiarization program and provide necessary training if the new member is not yet ready. A new member thus approved must attend the Rifle Familiarization program, which is usually held on the last Saturday of each month (check the Outdoor Range Calendar to confirm, as holidays may require rescheduling). The member is responsible for providing his own rifle and ammunition. For more details or information on rifle qualification, contact the Director of Rifle Programs at rifle@crpcprograms.org. Successful completion of the Rifle Familiarization program will result in the new member being certified to shoot independently on the Rifle Range. Any semiautomatic centerfire rifle with a detachable magazine must be certified as being semiautomatic only. To certify a rifle, contact a Range Safety Officer and request certification. The Safety Officer will instruct the member on the process, which usually involves firing no less than five magazine-fed rounds into the Sight-In Range’s backstop to test the rifle’s action. Once a rifle is certified, the member will be provided a certification card with make, model and serial number. The member is responsible for presenting the card to any Range Safety Officer or any Club officer upon request when using that firearm. Possessing/using any other Class III firearm (suppressors, short-barreled rifles, etc.) must meet all BATFE and local laws and regulations. The Club hosts a number of programs and events at the Rifle Range. All events are designed to accommodate shooter experience from Beginner to Expert Marksman – we welcome all to participate. Many programs and events are open to the public. We encourage you to review the programs, listed below and on the calendar, to learn more and sign up. For safety information or concerns, you may contact the Safety Director at safety@crpcprograms.org.